ISMEC specialises in the high-precision machining of medium and heavy components for the power generation sector. Headquartered in north-east Italy and founded in 1973, ISMEC also has years of experience in the welding, fabrication and assembling of medium and large custom products. With our experience of turning, milling, boring, grinding and welding, we are a strategic supplier of shafts, generators, motor cases, base frames, turbines, and bearings. We work with customers to supply customised components according to their specifications. ISMEC is certified according to ISO:9001 and ISO:3834 standards for welding. We are also implementing environmental sustainability standards through ISO:14001:2004 and our health and safety policy. Our skilled staff and technologically advanced equipment enable us to provide a range of services, including the development of projects, production and maintenance, precision mechanical processing and modern machineries with computer numerical multi-axis control (CNC). The power sector is one of ISMEC’s core business areas, and our capabilities within this sector have been expanded through investments in machinery. We supply a range of parts to the hydro sector, including turbine shafts, generator shafts, rotor shafts, guide bearings, shaft seals, nozzles, aeration group, complete turbines, and more. 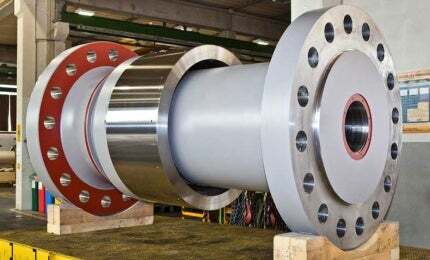 We also provide turbine shafts for gas plants, wind generator shafts, steam turbines, nuclear power generation, and rotors and stators for large engines and electrical transformers. ISMEC’s product range for the power sector includes medium-sized and heavy steel metalwork components. Our qualified steel carpentry department can manufacture complex welded parts for power plants such as large frames, motor cages and gearbox frames. These are tailored to meet specific customer requirements. Regarding materials, the machines are manufactured to work with carbon steels and a range of hardness levels, as well as quenched and tempered steels, stainless steels, non-alloy steels, tool steels, cast iron and some non-ferrous materials such as bronze and brass. ISMEC also provides a full supply service, which includes procurement of raw material such as forgings, castings and sheet metals, and accessory material, including screws, nuts, bearings, pipes and commercial items. To provide our customers with the highest quality products at the most competitive cost, we work with major forges in Italy and Europe. All material is produced according to the technical specifications set out by the customer. The relative certificates are issued, and the ISMEC quality department can carry out a witness inspection if necessary. Our quality department consists of specialised and certified personnel. It carries out daily inspections on products, including visual and dimensional tests, boroscopic tests, hardness control, and other customer-specific tests. ISMEC has recently increased quality capacities by purchasing DEA machinery. This offers customers high-accuracy inspections and 3D measurements of medium and large machined parts. We can also provide treatments for parts such as heat treatment, stress relief, sandblasting, painting and nickel and chromium plating. The systems we use ensure we can forecast the date of delivery as soon as an order is placed. This allows the customer to schedule its internal production effectively and efficiently. If delays do occur, the customer is notified and can can reschedule their processes. Once the finished product has been supplied, customers can access ISMEC’s post-sale assistance service, which includes maintenance on active components, rehab and refurbishment of damaged parts and replacement of defective components after on-site dimensional measurements. ISMEC specialises in mechanical machining, welding fabrication and the assembly of medium and large custom products. NET Power, a joint venture (JV) between 8 Rivers Capital, Exelon Generation, and Chicago Bridge & Iron (CB&I), has started the construction of a demonstration power plant at La Porte, Texas, which is touted to generate zero emissions.